It’s an odd thing to realize, but of the 10 Xbox One games I’ve finished since owning the console, 8 of them have been remastered versions of games that were originally released for the Xbox or Xbox 360 – with the exceptions being ReCore and now Halo 5: Guardians. It’s almost shocking how much prettier a game is when it was built ground-up for a modern console, and I was regularly gobsmacked – there’s a word I don’t get a lot of use out of – by just how gorgeous Halo 5 was. Anyway, since the last Halo Month post, I watched the “Halo: The Fall of Reach” animation, which wasn’t terrific, and played through Halo 5’s single-player campaign in normal difficulty. It was pretty good in a lot of places and a little weird in others, so let’s talk about all of the positive things. I think I’ll start with the guns, because it’s a game where most of your interaction with the world comes in the sense that you are trying to put holes in the parts of it that are trying to put holes in you. Some of the Halo games do not have very good guns, and even the best Halos have had one or two downright stinkers. Halo 5 does have One Bad Gun. I think it’s called a Plasma Caster or something? It basically shoots bouncy plasma grenades, which sounds way cooler than it actually is. I did not like it, and I only used one once or twice during the campaign. Every OTHER gun I picked up was really good. Even the needler! I have hated the needler in almost every Halo game up to this point, but the version in Halo 5 is actually….dare I say? FUN to use. The enemies are also much less irritating bullet sponges in this outing. Hunters are still, well, they’re Hunters and they take a ridiculous amount of damage to bring down, but I couldn’t help but notice that virtually every instance where a Hunter pair showed up came with a convenient Fuel Rod launcher or detachable turret just lying around somewhere nearby. Halo 5 also has a much more familiar control scheme – something that probably rubbed a lot of fans the wrong way when it hit, come to think of it. For the first time in the series, you aim down sights with the left trigger and fire with the right, and every gun seems to have an ADS mode. Speaking of sights, by the way, considering my rant from the other day, I was happy to notice that the default human pistol DOES have sights, which makes sense – all of the various rifles tie into the armor HUD to provide a sight, but a pistol is a weapon of last resort, so it’s designed to be used without access to armor. It’s a tiny detail that I liked a lot. The Covenant Carbine ALSO has a flip-up reflex-style sight, which again makes sense because it’s mostly used by Jackals, who don’t generally wear armor. Finally, the campaign was really compelling to play through – it felt like the game was over in no time at all, and it was quite difficult to stop halfway through so I could actually get some sleep, the first night I played it. There are a couple of little “walk around and talk to people” levels that provide breathers, but outside of those it’s just really fast-paced and always pushing you forward to get to the next big thing blowing up. Second, man, Halo games have never really had boss fights before this, and this has the same boss fight repeated like three or four times. It doesn’t ever get good, either, each one is pretty much a case of switching weapons to the Big Gun you picked up a few minutes back and have been saving, then blowing the Warden into small glowing pieces, in one case before he even had a chance to finish his megalomaniac speech about uh killing all humans or something. Third, when I said in an earlier post that Halo 4 sure felt incomprehensible without having read all of the books, that just goes double for Halo 5. 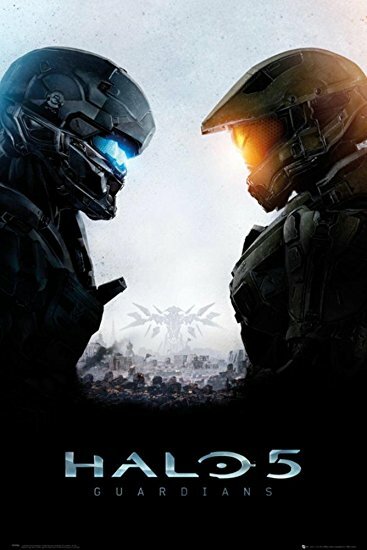 It turns out that even the two books from this last batch that I really thought might be skippable – “New Blood” and “Hunters in the Dark” – are actually kind of important to knowing just who the characters in Fireteam Osiris are and why Gunnery Sergeant Buck from Halo 3: ODST is a Spartan now. Real talk, if you want to enjoy Halo 5, you need to read at least a dozen books in addition to playing all of the previous games. Oh, and it all ends with one heck of a cliffhanger and suddenly it is vitally important that you know – again, from the books – that Elites have never really liked AIs and thus Elite ships don’t HAVE shipboard AIs. I suspect this is going to be a huge plot point in Halo 6. In theory, I COULD stop Halo Month right here. I’m caught up on all of the mainline games and most of the spin-offs. That’s, like, 10 games this month! But… I did buy Halo Wars 2 during the big Microsoft Spring Sale. I should try to take that off the backlog right away instead of letting it hang around.